The Massive Furniture Design ML-01 Swan desk is a British-built, stylish industrial studio desk designed by music industry professionals, for professionals. The ML-01 Swan arrives flatpack in a sea of bubble wrap, multi-wall cardboard, and is couriered very quickly to you after being constructed by hand, and undergoing their demanding quality assurance tests. The ML-01 is one of the best packed products I’ve had the pleasure of experiencing. Massive FD starts as they mean to go on. The assembly of the ML-01 Swan desk was done in fifteen minutes, there’s even a handy video instead of a tedious instruction manual to illustrate how things should be held and put together; this is available for viewing on YouTube, as well as on an included USB flash drive if you’re offline whilst building the desk. You do require two people to assemble it, and a colleague of mine was happy to oblige—who could resist building this beauty? The only tool you need is a hex key, and they supply you with one. The tools to assemble it with, including the fittings, should be the first thing you see when opening the package— it was only part-way through assembly that I realized the ML-01 shipped with a hex key. The desk should also ship with an inventory list so the customer can check off each component as it’s unwrapped before they begin assembly. Minor criticisms, but something that other manufacturers such as Argosy Console have established as somewhat of a standard. 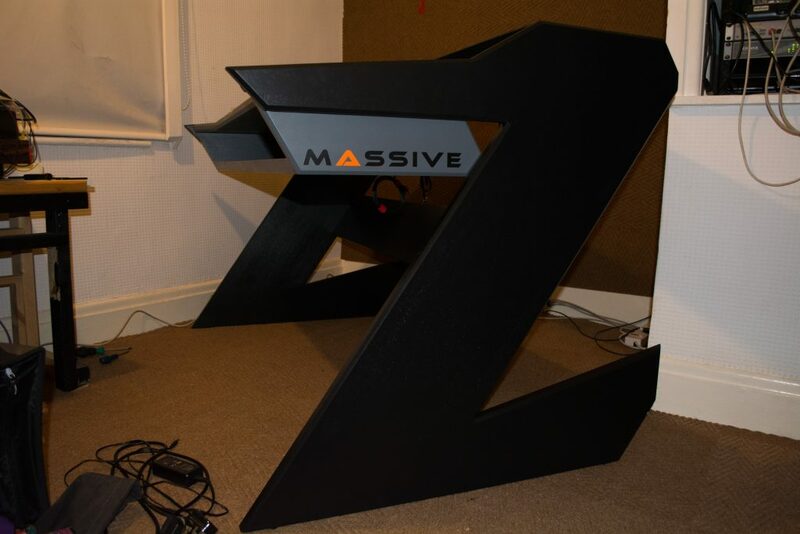 The ML-01 desk really is the physically largest and heaviest box I’ve ever been couriered, and for good reason, the desk itself is made of 27mm hardwood, and weighs 58.8 kg, it’s incredibly substantial, and has to be considering the weight of 19” rack mounted gear on it. Coming from a world of steel server racks, I was a little skeptical about wood holding 12U of gear, especially in 4U segments, but my fears were instantly allayed before I even took the desk out of the packaging; it’s that heavy. The desk measures 93cm x 154cm x 93cm (HxWxD). The legs of the desk are where the name ‘Swan’ comes from; they’re ‘Z’ shaped as you can see, similar to the silhouette of a swan, giving it a sleek, angular, minimalist appearance, with every part of it serving the purpose of structural rigidity; seriously cleverly designed. The ML-01 is unique, and hugely attractive, it gathers plenty of compliments from clients and colleagues alike, everybody wants to know who made it! The edges of the main desk area where you’ll put your keyboard and mouse feature beveled edges, giving a soft, smooth angle for your wrists to lean against, which won’t cut into your wrists over extended use. The quality of finish is outstanding, with matte finish black and grey paint all over, and some craftily applied decals on the front and sides featuring the suave Massive FD logo. My only criticism of the finish is that as the desk is for industrial use, it would be very useful if Massive FD listed the paint codes on their website in a maintenance and repair section, like other furniture manufacturers do with their industrial-grade products. The sole design decision that I would like to see improved is black or grey plastic over the first few millimeters or so of the desk in front of the rack spaces, or just along the rear beveled edge with it overlapping the top of the desk slightly. Black plastic along the top of the rear supporting strut where 19” rack gear rests to make sure that the desk can’t be damaged by rogue screws on the underside of rack gear would be useful too. We combatted this problem by placing towels on the desk whilst rigging it, but it would have made life a little easier to have the first few millimeters already protected so I didn’t need anybody holding a towel then removing it as we slid gear into place. The ML-01 is amazing to work on in terms of cable management, because the rear bracing strut is angled and the power strips and cable straps face downward, I can get at them all with zero effort just by lying under it– plus I get lots of light under there, meaning that swapping out bits of hardware is simple, which if you’re anything like me, means you’re always trying out new toys chasing fresh sounds. It’s a really big deal, and cable management finally isn’t the bane of my life thanks to some Velcro cable holders that make adding and removing cables from the install a cinch. The ML-01 features 12U of 19” rack space below an upper platform to support your displays and audio monitors. Massive FD even includes a big bag of high quality hardware to have matching screws holding your gear in place, that really brings the desk together in terms of design consistency despite being filled with products from a lot of different companies. Having all the encoders and switches at arm’s-length means I get tasks done in less time, which means more time to spend doing other things—like making more music! Any time saved whilst scoring is a big deal as the deadlines are usually days to a couple of weeks. The ML-01 changed my workflow beyond recognition, everything now flows smoothly. One of the metal struts featuring 19” rack holes also features a custom USB 3.0 hub, an ingenious feature for quickly inserting USB flash drives and other odds and ends. I was originally going to connect my Fnatic Clutch G1 laser mouse and Fnatic Rush G1 mechanical keyboard to this hub, but it’s so useful for USB drives that I changed my mind. As you can see from the photograph beneath my 3U Vented mesh blanking panel from our friends at VisioSound. I modified a 1U ventilation panel by drilling holes in it and fitting them with rubber grommets so that I can feed the braided USB cables through into the cable management system and keep the USB ports free for non-permanent devices. I would love to see Massive FD offer a secondary strut USB hub as an option, or as an after-sales accessory for purchase to people who want to maximize the functionality of their ML-01. I would be interested in an after-sales kit to attach casters to the desk, preferably braking ones, even if it involved drilling a few holes. The ML-01 ships with two very nice Masterplug eight-socket surge protected power centre units that allow you to use mains, USB, Ethernet, and a phoneline. As the Massive FD website doesn’t mention their spec or brand, this was actually the part that of the desk that I thought would be the least interesting, and a part that I thought I would end up replacing or not using—yet it’s actually one of my favorite features, and they’re incredibly high quality surge protectors. The two Masterplug units can handle 690 Joules maximum surge energy, and 22,000 Amps maximum surge current. The telephone port can handle 60 Joules of maximum surge energy, and 2,400 Amps maximum surge current. The Ethernet port can handle 500 Joules maximum surge energy, and 2.2 Amps maximum surge current. Very impressive, and Masterplug offer an unlimited equipment warranty to go with their 10 nano second response time. I suffer with a connective tissue disorder (Ehlers-Danlos Syndrome with marfanoid habitus), meaning finding comfortable furniture for long periods of use is really difficult, especially given my tall stature, but the ML-01 is ergonomically superb. The amount of pain I’m in on a daily basis is significantly reduced, and I’ve got far more energy as a result of it, my mood is also far happier on a day-to-day basis too. There’s a lot to be said for being physically comfortable whilst working. I’ve been more productive than I have in years since I started using the ML-01. I feel inspired again, and I’m feeling more creative than ever now that I don’t have to deal with the nightmare of cables around my feet under the desk. I’ve put in marathon all-day sessions in the studio as it’s just so comfortable having everything within reach and nice height and angles to access everything. Scoring All Walls Must Fall was blissful. 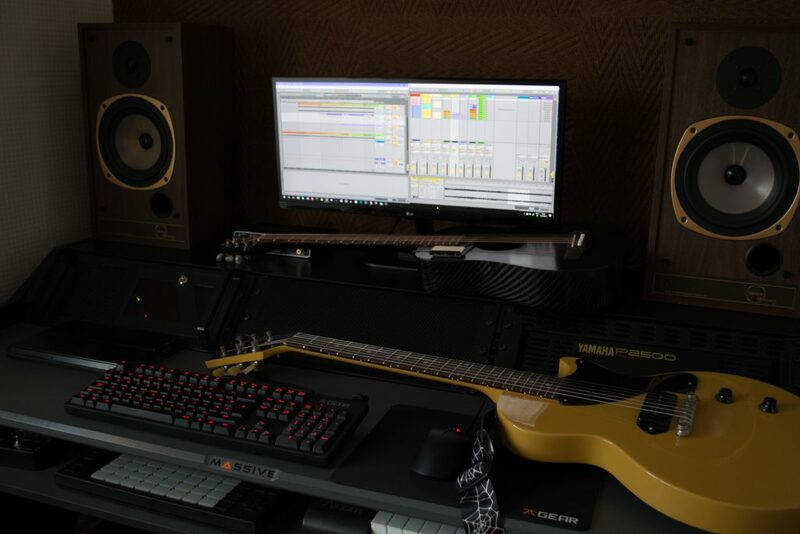 Being able to put countless instruments like electric guitars, the KLŌS 2.0 carbon fiber travel guitar, sarangi, and the ukulele on the desk makes swapping between instruments for overdubs very fast; this desk is huge! The sliding drawer, which is supported by strong, and smoothly sliding rails, makes utilizing my Ableton Push and other MIDI controllers very easy, the sheer size of it means that it can support a full-length musical keyboard. Massive FD state that the desk can fit two 19” displays along with audio monitors, though that depends on the size of your monitors and the size of your display bezels. One of the Apple Cinema Displays suffered somewhat of a mishap whilst rigging (oops! ), though they were a little long in the tooth at this point anyway—I replaced them with an LG ultrawide monitor, which as you can see, looks great and makes fantastic use of the space between my reference monitors, it’s actually the perfect fit, and I’m considering another above it for running film on rather than the projector. Massive FD’s customer support is based in the UK, and they are very respectful and knowledgeable, I’m really looking forward to seeing what else Massive FD designs in terms of furniture, it’s clear they’ve got a lot of potential as both craftsmen and designers. Massive FD are catering to a very meticulous consumer demographic that lives and dies by the quality of their tools, and I am happy to say that they tick all the boxes for me, and for the clients and colleagues that have witnessed the brilliance of the desk. I’m beyond chuffed with the ML-01, and I highly recommend it to anybody who does anything related to music for a living, be it production, mixing, or mastering, this is a desk that’s not going to let you down with continued heavy usage. Stay tuned for my Swan Songs EP, a record composed using the desk. At just under £1,000 including VAT (currently £990.80 at the time of writing), the ML-01 Swan desk undercuts competitors like Argosy Console by over £1,000, delivering a high-quality product that’s probably going to outlive the record industry, as well as the human race. I’ll be updating this review with new photographs and information as my gear and workflow changes and evolves. I have something very special planned for the center of the Swan desk, which I’ll be showcasing in the next few weeks- it’s modular and awesome. You can see me working at my Massive Swan Desk in the studio on my live stream. Stay tuned for further photographs and videos, or you can buy a Massive ML-01 Swan desk of your own from the Massive Furniture Design website.